Supermicro's UltraServer is one of the most efficient, reliable, consistent and effective systems available on the market. A high-end enterprise server, it combines power and performance with adaptability and money saving attributes. Made from the highest quality components, we configure your system to be perfectly adapted to your business needs. 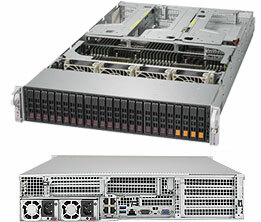 The Supermicro Ultra Server supports the very latest Intel Xeon and Intel Xeon Scalable processors. These processors are reliable, scalable and very powerful. The cross-bar technologies (that allow direct conversation between two CPUs), Intel UltraPath and Interconnect (UPI) are new advancements that make this processor even more effective. There is nothing worse than experiencing unexpected down time. This range comes with hot-swappable drive bays and redundant power supplies. Combined with the reliability of its high-quality components, this means that down time will be kept at an absolute minimum. These solutions are very highly scalable. They can be powered by the Intel Xeon Scalable processor family, which include some of the best processors available for effective scaling. It scales the performance, the bandwidth and the storage capacity simultaneously, allowing for a more stable and consistent level of performance. This range provides you with tech that is future proof. Things move fast in the world of technology but unlike the majority of other options on the market, you are safe when you choose a Supermicro UltraServer. These systems are specially designed to be future resistant and to be compatible with future technology. There are up to 4 add-on cards that are supported in 1U, and that number rises to 8 in the 2U version. The UltraServer range is very adaptable and can be configured to excel in a wide variety of different situations. We offer hundreds of potential configuration combinations, allowing you to choose a solution that perfectly fits the requirements of your business. These systems are compatible with a variety of different software's and physical components. Depending on your needs and the space in your data centre, this system comes in both a 1U and a 2U. The UltraServer range are some of the easiest systems to reconfigure after the fact if your needs change, making it one of the strongest choices on the market in terms of adaptability. With hundreds of potential configuration combinations, our range of solutions can be optimised for a number of potential uses. An example of a potential use is virtualisation. When you combine the high core count of its CPU, its low latency NVMe caching and the large onboard memory it possesses, these solutions are super effective when it comes to virtualisation. You can also optimise your system for cloud computing, data centre, HPC (high performance computing) and many more potential uses. 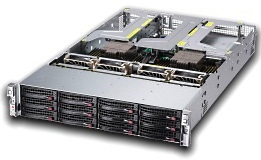 Supermicro UltraServers are well known for being very efficient both in the power they use and the space they use up. With a better expansion density than any 1U/2U system available today, they pack a lot into a little and do a great job of saving you space. Not only is a lot of space saved, but these systems do a great job of saving power and energy. They are configured with the highest efficiency power supplies. The systems are also more environmentally friendly than other options, due to their low energy usage. Finally, you also save a lot more money with this option as this range of servers are specially configured to generate you a lower TCO (total cost of ownership), which benefits you and your business long term. UltraServers are configured for the highest level of performance. With a powerful processor and components that perform well under heavy workloads, the solutions in this range are perfect for tough and demanding environments. We pride ourselves on being the No.1 providers of Supermicro products. With a strong reputation built over decades of producing high quality products, we believe that every clients business is unique and deserves a solution catered directly to them. Which is why we configure your Supermicro UltraServer to be as ideal for your business as possible.